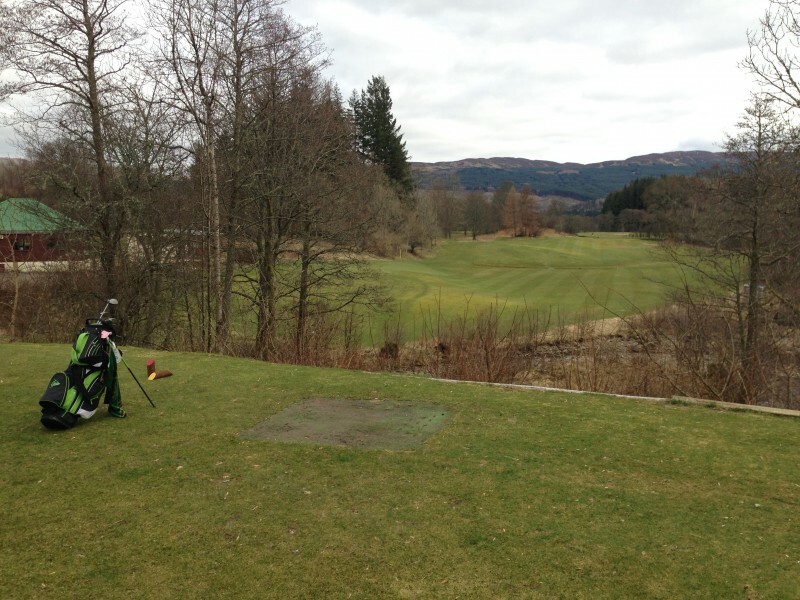 #25: Killin Golf Club: Picturesque Perthshire! 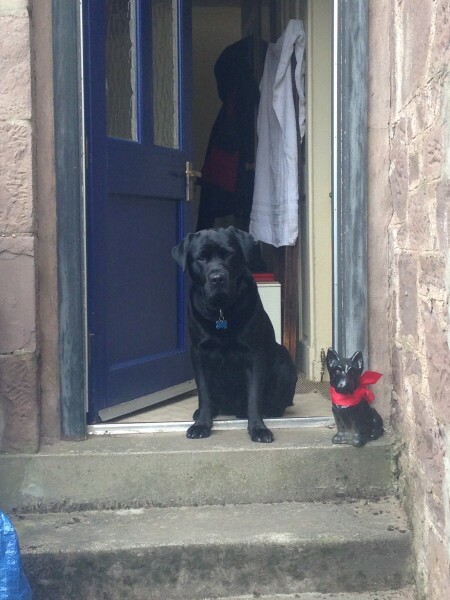 You are here: Home › Blog › #25: Killin Golf Club: Picturesque Perthshire! 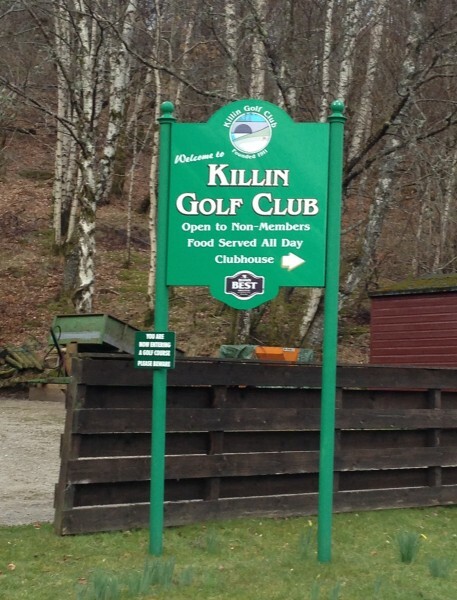 #25: Killin Golf Club: Unexpectingly brilliant in picturesque Perthshire! It’s golf season again in Scotland! It’s been an incredibly wet and mild winter in this part of the world. And just when the weather seemed to be turning, another storm rolled through bringing rain or snow or both. So not much golf has been able to be played since November. I was hoping to get a few more rounds in by now, but events have been working against me. I am determined to complete this challenge; however, I fear it's going to be an 'extended round'! He was begging to come with me. After having us around fulltime through the winter months, it is hard for him to look forward to golf season when he doesn’t get to come and we find ourselves often on the road. But I stiffened my resolve, and I left him behind on my way this time to Killin Golf Club. Killin is a lovely town nestled in the hills of Perthshire on the end of the Trossachs and Loch Lomond National Park. Killin Golf Club claims to be voted ‘the most picturesque 9 holes in Perthshire’ and it would have to get my vote, especially today! It was a calm March afternoon and I arrived to find the course and the club empty. I paid my fees through the Honesty Box system, and found myself the sole occupant of the golf course. What a treat for this lady who loves the links! It is a challenging first hole over a small ravine with a river below, but I took a deep breathe and tried to find the zone. I have been running a lot of late and the extra fitness is really paying dividends to my game. I hit a good drive and was off with a smile. 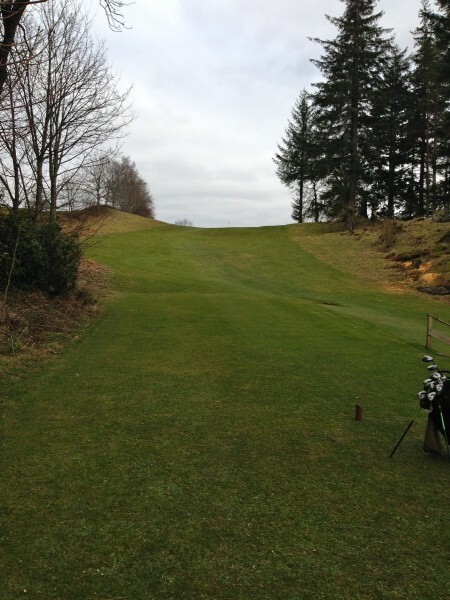 The course was in really good condition given the wet weather we have had this winter. They must have an incredible green keeping staff! The greens were in good shape, and I am sure once the season begins in earnest, they will only get better. The course is easy to follow. It is a lovely 9 holes set out with two interesting sets of tees so that the second 9 gives one fresh perspective of the course. And what a course it is! I loved it. 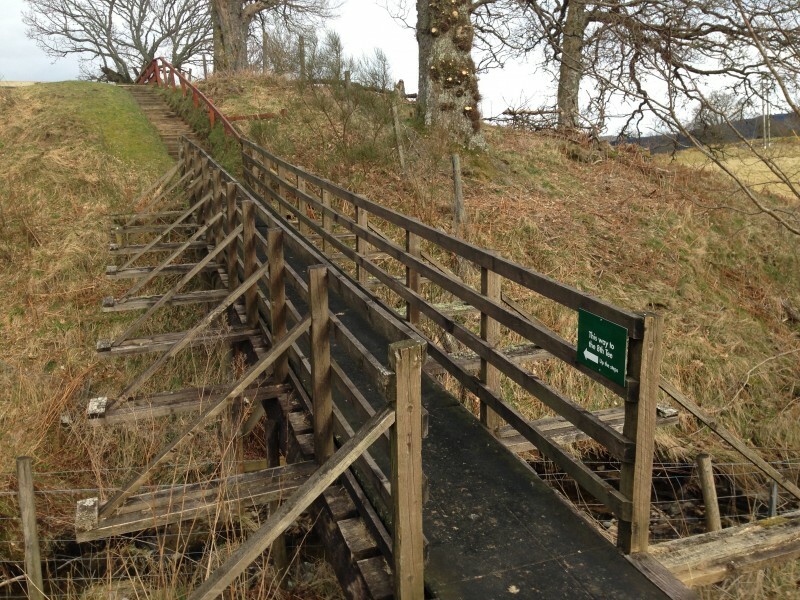 Killin Golf Club is challenging, interesting and unexpected. 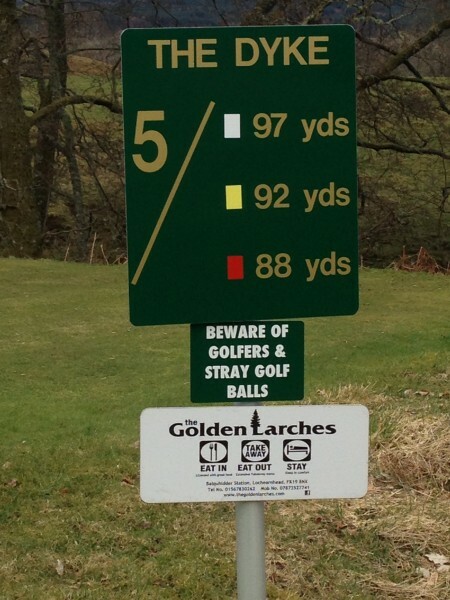 My favourite hole was the 4th. 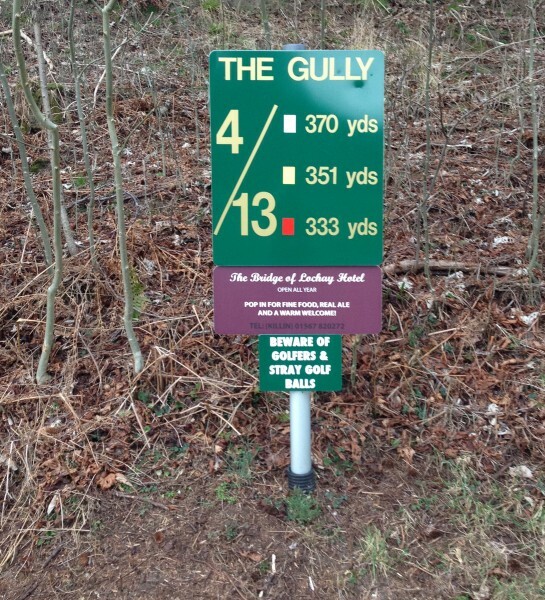 Pictured here, it is duly called ‘The Gully.’ It requires a series of blind shots to the green, which I found brilliant. Next I found, possibly, the most perfect Par 3 on the 5th. 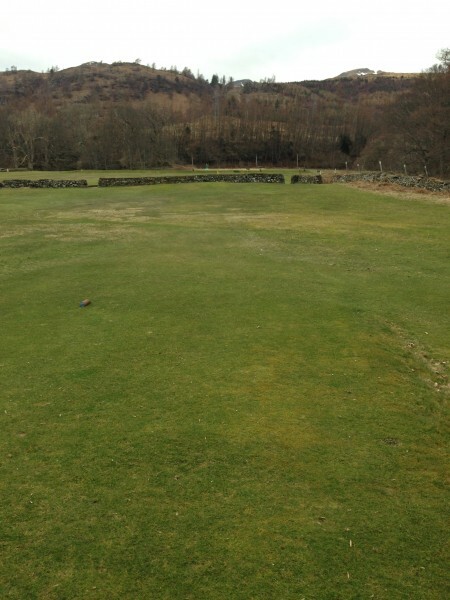 It’s an 88 yard par three over an old dry stone wall, properly called the Dyke. It’s awesome! It was a real challenge to get it right ... here is the view to the green from the tee. As the course unfolds, the views become even more breathtaking (not only because you are having to walk up hill!) but also for their splendor in the surrounding setting. The sixth is a downhill par four where the green is protected by some wicked green side bunkers.Here is my ball, and fortunate I was to just avoid the ‘Captain’s Bunker’! 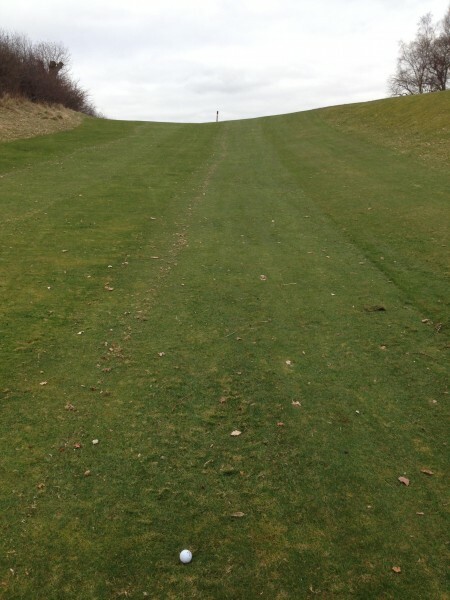 The 7th takes you back up the hill and to get to the 8th tee is a challenge itself. Lucky number 8 is another difficult 154 yard par 3. 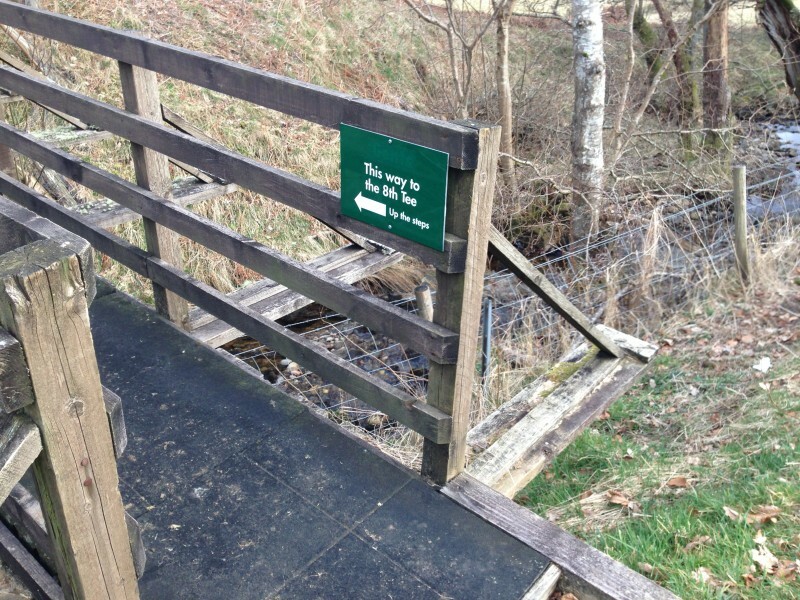 To get to the tee, you have to follow the signs ... up and over a bridge! And then you have to hit over a field to get to the green, where I am sure a plethora of golf balls fertilize the grasses. Fortunately, mine did not provide any ‘Miracle Grow’! I hit a good shot and was on the green. Once again thanking my husband and our former pro in Colorado, John Kusina, for my brilliant ‘I love golf again’ rescue club. It really did make me love golf today. I was exceedingly happy with a par as I walked to the 9th. The 9th is a terrific par 5 back down to the Club House. The views are magnificent looking down and the fairway to the river with the mountains in the distance. 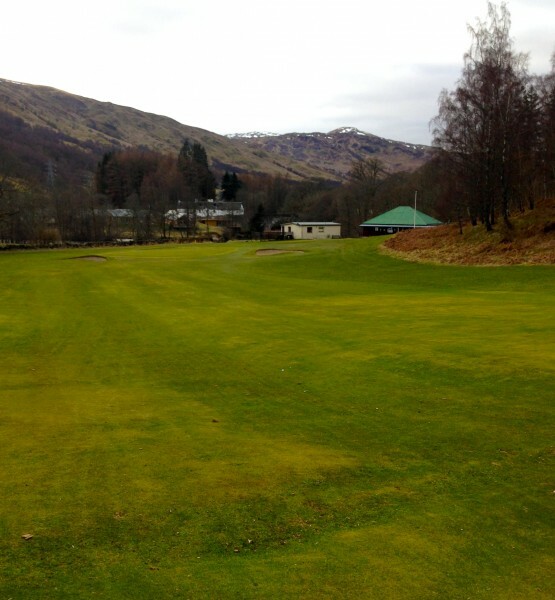 What a course: thank you Killin Golf Club, and what a terrific way to kick off the 2016 golf season! I have now been well and truly bitten by the golf bug. Killin the town is also home to the famous ‘Falls of Docherty.’ They are brilliant falls right in the heart of the town set by the river, a stunningly beautiful setting in the heart of Rob Roy country. It’s a wonderful wee Scottish town with some great little shops and a couple of brilliant pubs. I was wishing I had my friend Ann with me so I would have an excuse to stop and go in. Just another reason why ‘ladies and golf’ make the best of it: the perfect complement to each other! More to come, but I will be back to Killin and it’s fantastic golf course as soon as I can.